Honey and carefully selected herbs re-vitalise your skin and provide it with the necessary moisture. The regenerating property of ginkgo gives your skin vitality and resilience. 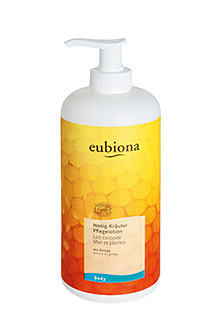 eubiona Honey and Herbs shower gel is the perfect shower gel for a spirited start to a day. This body lotion with ginkgo is the ideal compliment to the Body-Series’ shower gel. Protecting, skin caring honey and cyto-regenerative characteristics of ginkgo give vitality and resilience to your skin. Your skin is provided with precious moisture and feels smooth and fresh. Apply on still moist skin after every shower or bath, spread with gentle circling movements. 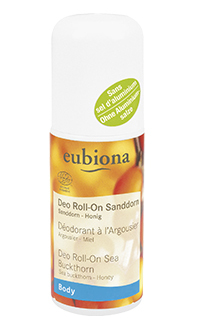 This soft and creamy deodorant lotion offers you a reliable and long lasting deodorisation and keeps you fresh all day long. Sea buckthorn and honey is particulary caring for sensitive skin.